From the rolling Appalachian Mountains to bustling city streets, Kentucky has it all, including gigabit (1,000 Mbps) service from Fiber-to-the-Home (FTTH) networks. That’s right, Kentucky - the state that is often used as shorthand in America politics to talk about coal country and poverty - actually has some of the fastest, most reliable Internet service in the entire country. We put together this map using the latest data sets available from the FCC to highlight how much of rural Kentucky has the gold standard in high-speed Internet service. This is just a brief snapshot using the June 2016 Federal Communications Commissions (FCC) Form 477 data set. 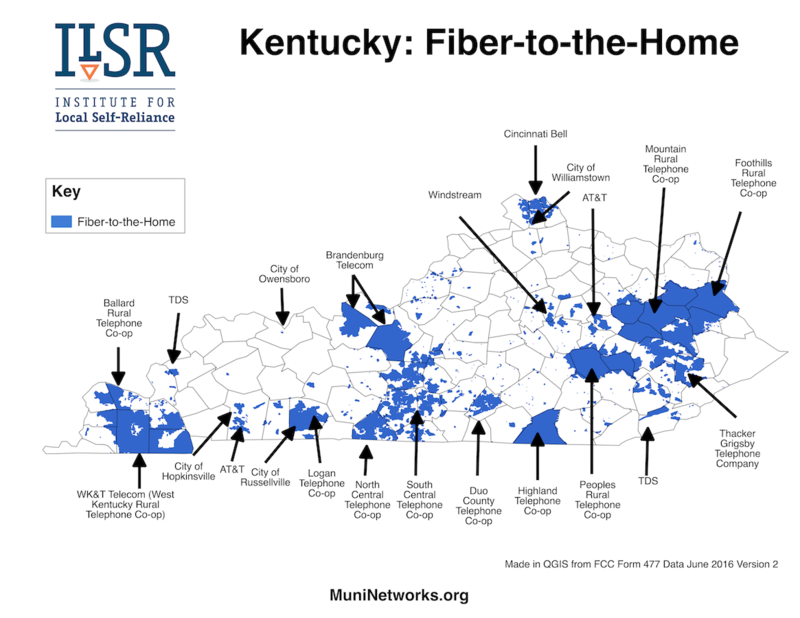 This map shows all the FTTH infrastructure available in Kentucky according to the data submitted by ISPs. This data is reported on the census block level and may overstate coverage. Even so, the data reveals how cooperatives provide high-speed Internet service to much of rural Kentucky. In southwest Ohio, a new broadband cooperative is taking shape and taking steps to bring better connectivity to residents, schools, and businesses in their region. The Greene County Broadband Cooperative recently released a Request for Proposals (RFP) for a consultant to conduct a broadband feasibility study. Responses are due October 27. The organization wants to bring gigabit (1,000 Megabit per second) connections to the communities of Cedarville Township, Clifton Village, and surrounding areas. They are especially concerned about bringing fast, affordable, reliable Internet access to the Cedarcliff School District and students in the area. The cooperative also notes that they hope to expand access to other townships in the eastern areas of the county in the future. Service speeds provided in the villages and in limited rural areas are 12-50 mega-bits per-second. Much of the service area has either a single DSL provider or satellite Internet service, both of which fail to meet the FCC’s standard of broadband speed. Combined with the data usage caps of wireless and satellite Internet providers, most rural residents have an Internet access that is functionally useless. The residential population of the area too be studied is approximately 9,700 which does not include an additional 3,700 students who attend Cedarville University. Because the University has its own fiber optic infrastructure, students attending the college don’t have the same connectivity problems as local residents. Of the students attending the local public schools, 64 percent use DSL at home that hampers they ability to complete online homework assignments. The broadband cooperative recognizes that the area’s economic development prospects depend on better local connectivity. According to the RFP, businesses have left the area or chosen not to expand in Cedarville due to poor Internet access options.